Loyola Academy of Wilmette, Illinois was a late addition to the Rockford football schedule for 2018 when the Rams were left scrambling to fill the void for the first game of the season to fill a nine-game slate allotted to all Michigan teams. 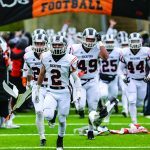 Rockford knew they would be facing a talented team as the Ramblers had made title game appearances in the largest division of Illinois football each of the last three seasons (winning it all in 2015). Loyola lost most of their offense from last year but returned a large chunk of a stingy defense while looking to make a fourth consecutive trek to the championship game in the «Land of Lincoln». 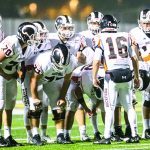 That definitely appears to be a possibility after the 2018 opener as the Ramblers used a stifling defense combined with a big play passing attack to cruise past Rockford 27-7 at Ted Carlson Stadium in Rockford on Friday, August 24th. 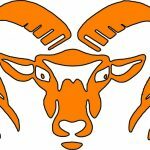 The first half saw the Ramblers take a 17-0 lead into the locker room that could have easily been 31-0 were it not for a pair of errant snaps in the shotgun formation that led to Rockford recoveries and snuffed out a pair of long Rambler drives. A pair of touchdown passes (38 and 18-yards) sandwiched around a 25-yard field goal was all the scoring in the opening 24 minutes. Loyola out gained Rockford 268 yards to 38 in the first two quarters. Munger tried running inside, running outside and passing but the stout Loyola defense seemingly had two or three defenders ready to stuff the play whatever the destination seemed to be. The second half saw the Ram defense acclimate themselves to the Loyola offense as they allowed only 112 yards over the final two quarters. But the Rambler defense refused to almost literally give up an inch over the duration of the third stanza as the lead grew to 27-0 after an interception return for a TD and a 34-yard field goal after three quarters. The Rams finally got on the board midway through the final quarter when Jack Richardson rambled three yards on a fourth own and goal counter play that finally gave the home crowd something to celebrate. Teagen Lenderink added the point after and it was a 27-7 game with 6:04 to play. Rockford moved the ball down to the Rambler 24 later before another interception stifled that thrust. Things will not get a whole lot easier for the Rams this week as they make their first road trip of the season to take on another traditional power in Lowell. In deference to the Labor Day weekend, this contest will be played on Thursday, August 30th as the Rams look to right the ship.